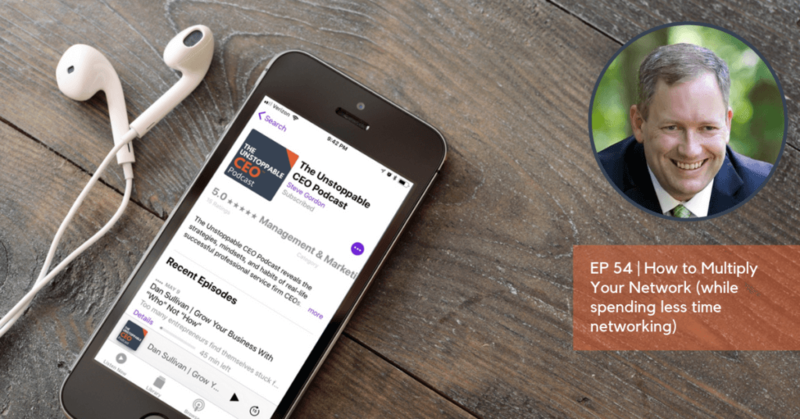 In this episode, I’m excited to announce the release of my new book, The Exponential Network Strategy! If you’ve ever been frustrated by the amount of time and energy required to “network” and disappointed by the results, this episode (and the book) will help. You’ll discover a new way to create real business relationships that lead to referral opportunities. And, in the episode, I share how to become “The Success Journalist” in your niche…a technique for getting access to you most important prospects. This episode is particularly special because we’ve got a big announcement. My brand new book, The Exponential Network Strategy, is out and available. We’re excited to share it with everybody. We’re going to do something a bit different. I’m going to talk a little bit about the book and share some of the insights that are in the book with you, and then I’m going to tell you how you can get a copy of the book for free. First, I want to talk about why I wrote this book. It’s a book about how to expand your business network and how to create business relationships that are real, that matter, that have substance to them. It’s unlike the ones that are created at most networking events where you show up and somebody sticks a business card in your face and you walk away hoping to build that magical, mystical, mutually beneficial relationship that frankly, in my experience, hardly ever materializes. There are a lot of good intentions behind that, but most of the time those relationships don’t become fruitful. What I have been doing for the last seven or eight years or beyond that, is follow this technique as many as fifteen years ago in my first business as a method that allows you to build a relationship to give a tremendous amount of value without a whole lot of energy and effort invested on your part, but a lot of value to the person that you’re networking with. It brings with it a lot of leverage so that for a small input of your time, you get a big output in a big result. That’s what The Exponential Network Strategy is all about. In the book, I walk you through all of that. I want to share just a little bit of it with you. The reason that I wrote this book is because for most of us, the advice that we get about how to build business relationships and how to grow our network comes down to get out there and see and be seen, shake hands, kiss babies, and go to all the networking events that you can go to, cram as many as you can in an otherwise busy schedule. In fact, one of the big international business networking groups advocates the idea that you need to spend eight to ten hours a week on growing and building your network. Certainly, that can pay big dividends, but in reality, there are very few people who can devote that time to growing their network. What you’re going to discover in the book is a way to get that same effect, probably a bigger effect, in an hour a week. In some cases, it can be done in an hour to an hour and a half a month. It’s accessible. No matter how busy you are, you’ve got the time to do this. Back when I was doing a lot of networking and business development in my first company, I spent a lot of time at networking events. I’d go to a breakfast event. I’d probably have lunch with a referral partner or coffee with a referral partner during the day. Then oftentimes at night, at least a couple of nights a week, there would be a networking social, a mixer, or a chamber event. All of those things were great, but after a while it begins to wear on you and it can become very difficult to keep it up. I’ll never forget, I was going to all of these events and I kept seeing one particular vendor at all of them. He was an older gentleman. I was in my 30sat the time and he was in his 60s, so quite a bit older than me. He’d seen it all and done it all. I get to talking with him and we became friends. I got to appreciate the fact that he had been working it through this circuit for decades and he knew everybody that there was to know. He’d seen it all, done it all. Honestly, he had gotten a little bit cynical about the whole process. It hit me one evening, we were sitting at a bar together towards the end of a mixer, and he was a little bit burnout and you could tell. I realized at that point that if I kept going doing what I was doing, I was 30 years away from being that guy. I knew at that point that I needed a different approach, an approach that allowed me to focus on my business, allowed me to make the relationships that I needed to make, and allowed me to get home and spend time with my family and do the other things in life that I wanted to do and have some balance. I’ve written about this guy before and what I saw him doing is what I call the hamster wheel of death. He’s just going and going and he couldn’t get off because he didn’t have a better method of creating the relationships that he wanted to create. That’s a scary and dangerous thing. I don’t want to be on the hamster wheel of death and I don’t want you to be on the hamster wheel of death. It’s a terrible place to exist. Some of you may be there. You may be in that place where you’re just trying to hustle and build relationships. I get it. I know that you need to do that sometimes, but it’s not sustainable for the long run. You need a way that gives you some leverage, some scalability to the whole thing, and works a whole lot better at the same time. That’s what the book is all about. I wrote this for people who are sick and tired of the old networking, of doing that time-consuming show up and mingle in a room of people that for the most part are there because they want to sell you something and aren’t necessarily there for a real relationship. I’ve just found that those never pan out. Occasionally, you’ll find a good partner. I used to go to those events and I had a coach at the time, a sales coach, who was mentoring me. She taught me, “Show up and have your quota in mind. When you get your quota, you can leave.”Sometimes my quota was I needed to meet two quality people. Sometimes, I needed to meet four. It was a struggle to find people that weren’t in it all for themselves, and that can get frustrating. We’ve all been cornered by that person that leads with their business card. We never want to be that person. You want to find a way to build these relationships and do it where you’re coming from a place of value from the beginning, and that’s easy for you to do. One of the big challenges I had when I was doing that old style networking is that after I met somebody and we connected and felt like this was a relationship to where we can help one another, I felt like I had to run away and go and find that person a great referral or a great connection or an introduction. Oftentimes, when you’re working in a high trust business where you’re selling at high ticket and you’ve got to have good relationship with clients, it’s difficult to go find that referral. Imagine an attorney. If you’re trying to refer an attorney, it can become really difficult because you’ve got to know somebody that’s got a big legal problem that they need that help right now. If you want to refer a financial advisor, you’ve got to know someone well enough to know that if you refer a person into them who is going to trust them with their life savings, that they’re going to take care of that and be a good steward of that. In our types of businesses where there’s a lot of money involved typically and a lot a lot of trust, you’ve got to have a very good relationship with that networking partner before you can refer them. I’d go out and try and find those referrals or find those connections, and I always found it to be difficult to do. I found that even though when I was able to do it, oftentimes I wasn’t having that reciprocated. It was a one way street and I was wearing myself out doing it. The book is for people who are experiencing that and want a different way to grow their network. Frankly, it’s also for people who are looking for an easy way to access their prospects. That’s very different from the old school trying to beat the door down and attack through the front gate to get into see a prospect. This method that we talk about in the book is an excellent way to get in front of your very best prospects as well. What you’re going to find in the book is a way to network that gives you leverage. It’s something that’s a lot of fun to do. It’s got a high-perceived value so the people that you’re networking with will look at this because it’s so very different. They’re going to look at this as a unique and valuable activity, and they’re going to want to be involved in it. The value in this is you’re using a method of connecting with people that has super high-perceived value, doesn’t take a lot of your time, and allows you to network with some people that are otherwise hard to reach. The way that we do that, the mechanism that we use, is an interview. This podcast is an example of this whole process. With the podcast, we reach out to people that I want to be connected with. We invite them on to do an interview. It allows me to say to them, “I have a way I can promote you. I can share your expertise and your knowledge and your wisdom with all of the people that I know. I’d love to do that. Would you be willing to sit down with me for 30 minutes and have a conversation? We’ll have a lot of fun doing it. I promise that you will be able to pull your expertise out of it, no preparation involved or nothing. We just get on the line and we talk for 30 minutes.”In doing that, I’ve created valuable piece of media that I get to share with you and all of our podcast audience. I also get the opportunity to give something to that person that not very many people are going to give them in a given year in some cases and in many markets outside of marketing. You may be the only person that ever invites your guests, the people you interview, the people you’re networking with, to come and be interviewed. It’s a unique experience, particularly when you get outside the marketing world. That’s where I started doing this back before podcasts even existed. We used to interview people over the phone and record that and put it out on CDs. This fundamental strategy gives you a very strong way to open up a relationship without you having to go, run around and find a high-value referral. It has the same or maybe even higher-perceived value because it’s so very different. You could be the only person that ever interviews the particular person you’re networking within their life, and because you’re creating that unique experience for them, it makes you very memorable to them. It creates a great deal of reciprocity in that relationship and it can be very valuable. I talk in the book about how to take that and then use that to add value to the other person’s network in a couple of different ways that can help create sales for you. You’ll find in the book the blueprint for this entire strategy, how to do it, how to approach the people that you might want to interview, that you want to network with and connect with. The interviews are just the mechanism. This is all about being able to get in touch with someone that you want to have a relationship with in business and approach them in a way that is non-threatening, that is all about them to begin with, and positions you very uniquely. Creating that unique experience for the particular person you’re networking makes you very memorable to them. One of the things that I talk about in the book, in the pre-release of the book we’ve gotten a ton of great feedback on, is what I call becoming the success journalists for your niche. If you have prospects that are difficult to reach, prospects that you want to get into, but you don’t want to show up as a salesperson, especially not at first, one of the things that we found with our clients to be successful is to be what I call the success journalist for your niche. What I mean by that is you can go to your best prospects and tell them, “You’ve been very successful, Mr. Prospect, and I’m on a mission to document the success of the leaders in this industry. You’re one of the ones that we’ve identified. We think you have a great story to tell and I’d love to sit down and interview you and talk with you about what’s made you successful in business.” It’s a fantastic way to open up a relationship with a prospect that may be very difficult to get to, particularly if you’re selling B2B and trying to get at the top level of a company. What I found is that most business owners, most CEOs, want to give back and they want to share what it is that got them to the top. Most of them are very open about that. If you give them the venue to do it, they’re going to want to do it and they’re going to feel good about that process. It’s an excellent way to become an authority in your niche very quickly. If you’ve got a bunch of business owners in a particular industry that you’re targeting, especially if they associate with one another as happens in almost every industry through trade associations and things like that, when some of them find out that you’re interviewing others about how successful they’ve been, ego kicks in and pretty soon you’ll have people chasing you down. They’ll want to be interviewed and want to share their story as well. I talk about how to make this work in the book. I wanted to give you that little preview because it’s such an effective way to start a new relationship with a prospect. I don’t want to give away the whole book here because we want to give the book to you, and there’s a lot of detail that we couldn’t cover in a podcast episode. I wanted to give you that little preview of some of the things that are in the book. It’s just one of the techniques that we share. I know that those who get it and who apply it will see some fast results. That’s what we’ve seen as we’ve implemented and that’s what we’ve seen as our clients have implemented it. I want to talk a little bit about how to get the book and what you get when you go and get the book. The book is available on our website and it’s also available on Amazon.com. If you want the paperback version of the book, go to Amazon. You can get it there and they’ll ship it to you for the price of a book. I’m not sure what they’re charging. On any given day, they adjust their prices, but it should be around $10 for the paperback. If you would prefer the e-book and the audio and video program that we’ve put together around this, you can get that on our website and it’s completely free. You can just go there and get it for free. We want to give it to you. When you go there to get it on the website, you’ll get a PDF copy of the book that you can download. There is a special audio and video interview where I sat down with one of our long-time clients, John Curry, who you’ve heard on the podcast before. John and I sat down, he interviewed me and we went chapter-by-chapter through the book. Not only do we share the strategies and techniques that are in the book, but because John and I have such a strong relationship, he was able to help dive in and help us get a lot of clarity around what the book covers, and do it in a way that’s hopefully a little more interesting than just somebody sitting there and reading the text of the book. You’ll find that unique and interesting. When you go to the site, it’s completely free. You’ll get the PDF e-book and you’ll get all the audio and video content that’s there. We want to get this out to as many people as possible. You can get that by going to the website. It’s at UnstoppableCEO.net/ExponentialNetwork. In fact, if you just go to our homepage, you’ll see the book right there. You’ll be able to get it right off the homepage as well at UnstoppableCEO.net. All that I ask is that when you get the book, if you read it and if you find it valuable, share it with the people in your network. If you get them reading it, what’s going to happen is they’re going to understand the strategy as well, and you’ll be able to work together with them to be able to together build a bigger, stronger network for everyone. I’m encouraging you to share it with them. You can send them there and they can get their free copy as well. It will create for you a powerful way to build business connections. I get asked all the time, “Is this just for people who are in marketing or have big podcasts and all that?”It has far more effect for local businesses who are focused on smaller niche markets and want to be the authority in that market. If you think about it, if you’re in a local market or if you’re in a small niche market that might be regional or even national, but a niche, it’s very easy for you to be become the go-to authority, the recognized authority, in that niche if you’ve gone around and interviewed all of the experts. You become associated with them. You get the authority that they have, it rubs off on you. It allows you to do something for those people that nobody else is ever going to do for them. Those people are never interviewed in any media. The fact that you’re able to do that for them and share it, whether you simply just email it out, whether you create a full podcast, no matter how you do it, you’re going to be interviewing them and you’re going to be sharing it with people, and that’s going to be valuable to them. It doesn’t matter what type of business you’re in, this can work well for building connections for you. As I said, we’re excited about it. We’ve been doing this for a number of years and it’s been a huge benefit to growing our network and taking things to another level. I know it’ll do the same for you. You can get the book by going to UnstoppableCEO.net. Either look for it on the homepage or you can go to UnstoppableCEO.net/ExponentialNetwork and download it there. I’d love for you to read it and I’d love for you to send me an email to Steve@UnstoppableCEO.net. Let me know what you think. Let me know how it goes the first time that you asked somebody to be interviewed. We’ve got a complete script for how to do that in the book so it’s easy for you. I’d love to hear the success that you’re having. I hope you enjoy the book and good luck.